The Running Man introduces us to Ben Richards, a young man living in 2025 who has been blacklisted and can’t find a job. Growing more desperate, with a sick infant daughter and a wife to take care of, he goes to the headquarters of the Games Network in hopes of landing a spot in one of their shows. While these shows offer a decent payment, they also offer disfigurement or death to the participants, all for the entertainment of the masses. Because of his intelligence, health, and blacklisted state Richards is slated to appear on The Running Man. He is sent out into the world with a twelve hour head start before hunters begin tracking him down. For every hour he stays alive, he earns $100. Viewers are encouraged to report sightings of him for a reward. This is the world Stephen King envisioned way back in 1982. I’m not saying that our world has become what he envisioned, but it’s also not 2025 yet. In his world the air in cities is so bad that lung cancer is out of control. A few people live well, but the majority (the 99%?) are so poor they work at jobs that compromise their health and subsist on subpar fast food, but everyone has FreeV to provide entertainment and doctored news while libraries and real knowledge are only for the elite. Something about all that hits a little close to home for me. Especially with American’s obsession with reality programming. Is it really such a big leap from Fear Factor to The Running Man? Maybe, maybe not. 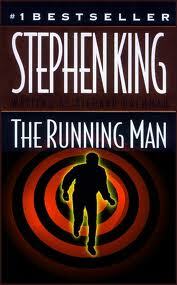 Reading this, it’s easy to see why Stephen King has been such a vocal fan of The Hunger Games. A lot of the themes are the same, and both books convey the same feelings of class division and blood sports to the reader. While King’s book is darker, it’s also a more believable vision. He paints the image of decaying, still inhabited cities as accurately as a man who is standing inside one. The stark differences he creates between the haves and have-nots are easy to imagine. Richards is a desperate man, and the reader feels that with him. While he does things we would like to say we wouldn’t do, you’re rooting for him to do those things because it’s the only way to survive. From start to finish, this book pulls you in and sets your head spinning. The chapters are fairly short and add to the urgency of the whole thing. You might as well be piggybacked on Richards because you are there with him. This might be King’s greatest gift as a writer. I would recommend this book to anyone else enjoying today’s boom of dystopian novels, because obviously King was thinking about it while half of today’s authors were still reading Doctor Seuss. A word of warning though, don’t read the forward, because King spoils the ending in it, or at least he did in my edition of the book! Gotta say, while not a big King fan, this is one of my faves, and I really liked the movie adaptation. Richard Dawson rules.